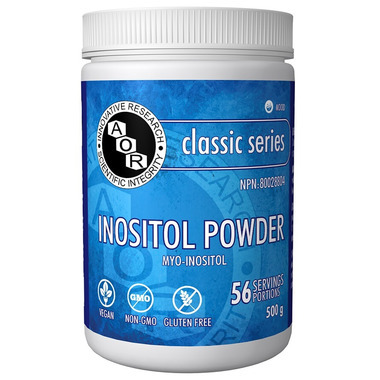 AOR Inositol Powder contains myo-inositol, a B-vitamin-like simple polyol. Inositol forms the basis for phosphatidylinositol (a key cellular phospholipid), is a lipotropic factor, and is involved in cellular signal transduction. Importantly, recent research supports a role for inositol in cellular defense and normal cell growth and differentiation. Clinical research indicates that inositol supports mood balance. Directions: Adult Dosage: Take 1 heaping tablespoon twice daily with food, or as directed by a qualified health care practitioner. I have been using this product twice a day for about a month now to treat OCD and it's nothing short of miraculous! It's the off-ramp from the hamster wheel that those of us with OCD desperately crave. I can't recommend this product enough. If you've been searching for relief, this is it! A better bang for your buck than buying the capsules. Using for PCOS symptoms as this is a highly recommended supplement for many PCOS symptoms. Tastes slightly sweet when stirred into water. I purchased this at my NP's recommendation to help with PCOS. It's tasteless and mixes well into liquid. I take it twice a day so I usually mix it into my morning smoothie and have no idea it's in there. At night I will mix in a small amount of juice or water. Great value for the price! I use this for PCOS and a thyroid issue. It has a mildly sweet taste. I find buying the loose powder in bulk more convenient than the pills, since you can easily adjust dosage and dissolve it in water for ingestion.